There is always something exciting and amazing about spending some time in the outdoor spaces o the house like a garden, patio or backyard. As they offer fresh air, natural scenes and the relaxing ambiance to be enjoyed along with the company of your dear friends and family members. 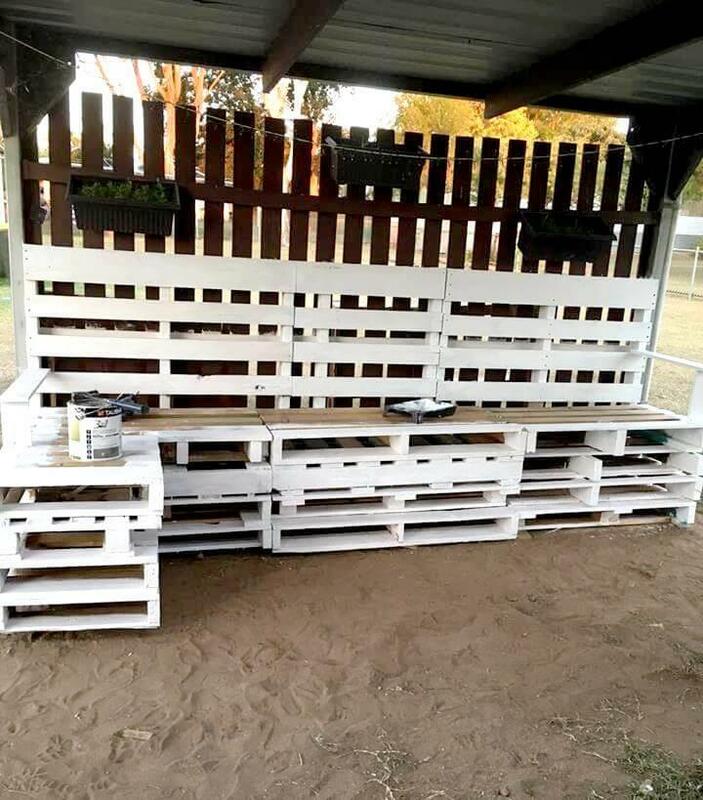 And these spaces can be made to look more groomed and well established with proper seating and some cute embellishing projects which can be totally cost fee if you use the recycled pallets. 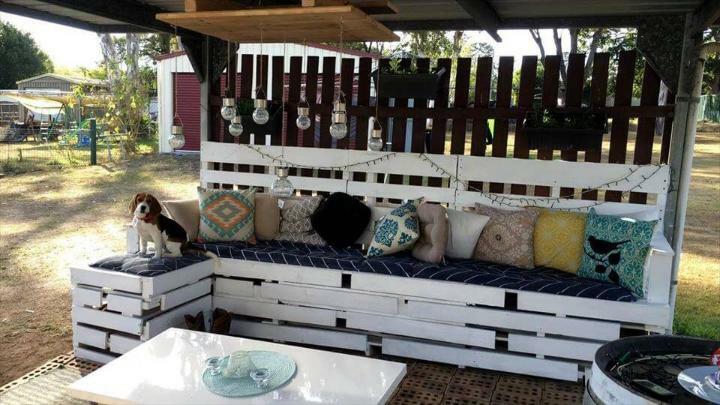 You can seek inspiration from this DIY pallet patio furniture and embellishing which includes a larger size pallet sofa with coffee table and a pallet made roof chandelier adding lights to lighten up your night gatherings and fun hangouts. The sofa has been made from the nice stacking of the pallet skids and slat piece with the coffee table standing on the steel bracket legs. Lighting also has been added to the back of the sofa to make it look more captivating at nights. The chandelier is the pallet skid having been inserted with some bulbs in hanging positions. 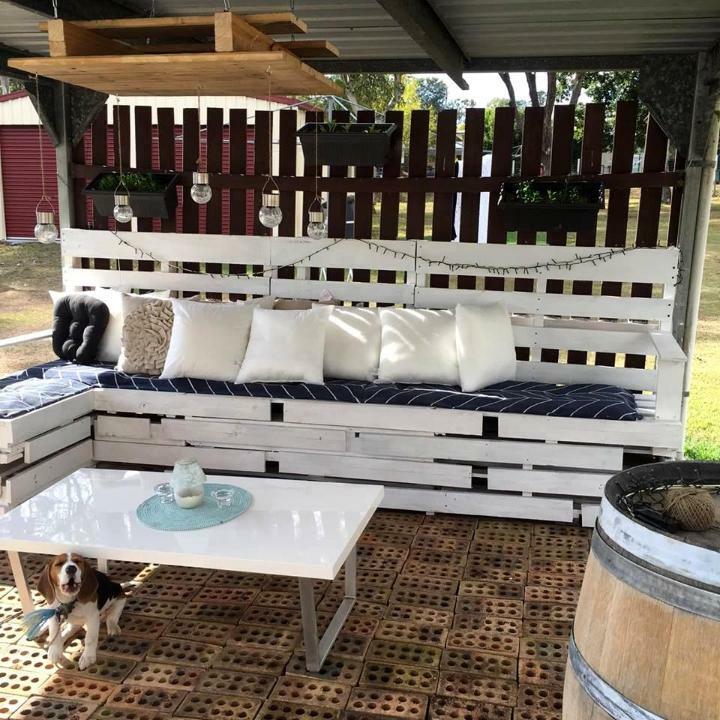 A patio is also fun and enjoyable place with the family and the friends and this one made from the pallets would cost you zero for the furnishing of the patio and enjoy some quality time with the family and friends. 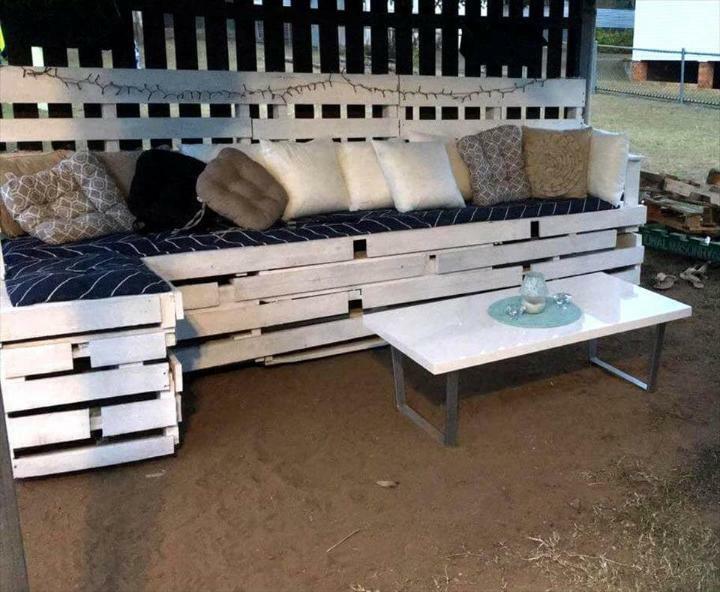 The main and the major thing in a seating set is the sofa or the chairs and here we have a large size pallet sectional sofa in L shape which has been made from the piling of pallet skids at the seat section and the slats form the back. 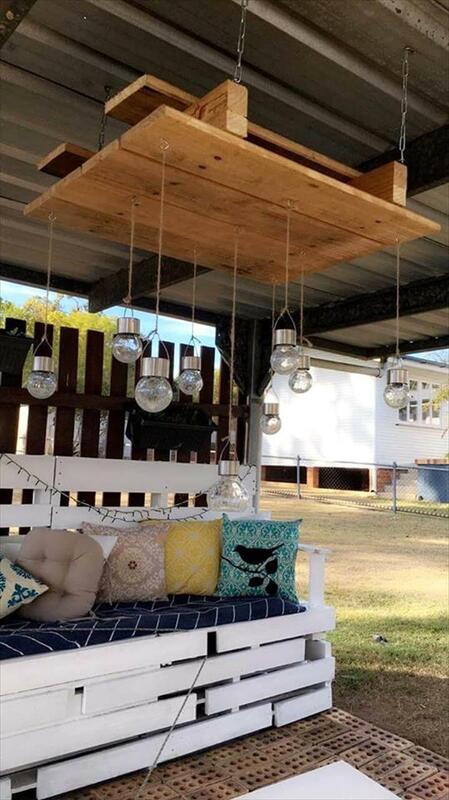 To add more decorative and beauty value to the patio this pallet made chandelier has been made using a pallet and some bulbs so that you can also enjoy the outdoor fun at nights either in winters or in summers. The center piece of the seating set is the gorgeous and cute pallet coffee table which reveals a pallet made top and the steel bracket legs which make the table look a truly modernly styled piece with the white stain. The sofa has been made to look more stylish and gorgeous by adding more fun and fabulous thing to it lite the blue mattress over the white stained sofa and the colorful cushions and d lighting string at the backrest of the sofa. 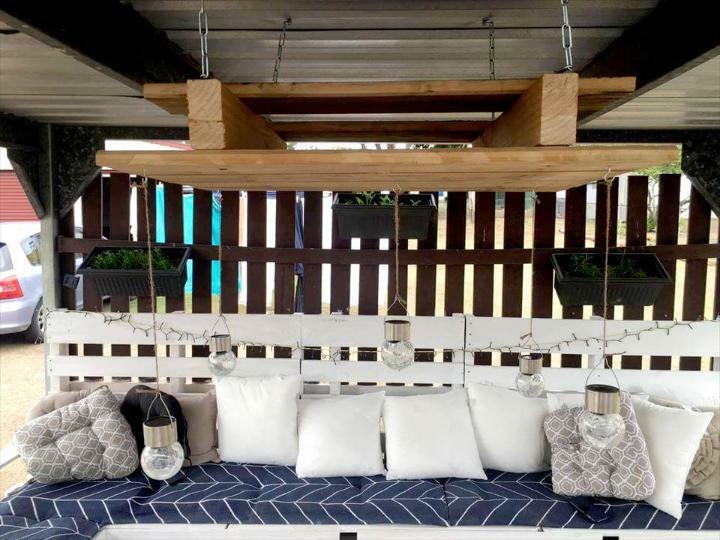 Small and thin chains have been used to make the bulbs hang and suspend with the pallet skid and the thick metal chains have been used to make the whole chandelier get hanged with the roof with the rustic brown color of the chandelier adding some natural vibes to the patio decor.